Home > Testimonials > Debra W.
My experience with Matt Hanson and his team was nothing less than outstanding and exceptional. It is very rare in today’s market to find a realtor who is honest, trustworthy, has high integrity, is patient and understanding and displays a genuine care and concern for your needs. He is very easy going and quite frankly, just fun to work with! I can tell you with utmost certainty and confidence that you will find these qualities in Matt Hanson. Matt’s philosophy is that you do not pressure your client – rather you work and listen to find out what your requirements are, answer all of your concerns, point out details that you may not have considered and help you through the process as painlessly as possible. He looks out for your very best interests, pays close attention to every detail and assures all negotiations (from the contract process through the closing process) are done in a timely and professional manner. Most surprisingly though is that Matt’s service does not stop there. He has offered great referrals for contractors and local vendors to assist in getting my home ready for my needs. When I had a heating issue after close he made sure that the warranty company responded in a timely manner. Additionally, since I am 3500 miles away, he is even taking the time out of his day to let the furniture people in to set up my bunk beds and dresser. Now that’s goes way above and beyond!! 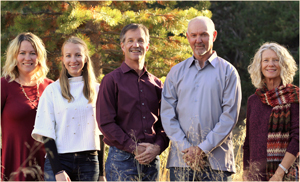 Because of this exceptional service, I am using Matt and his team to manage my property’s ski lease as I am very confident that this will be handled with the same professionalism that was done in purchasing my lovely ‘Slice of Heaven’ property in the Tahoe Donner area. Thank you so very much – Matt, Samantha and Lauren – for all your assistance and I look forward to our continued working relationship.